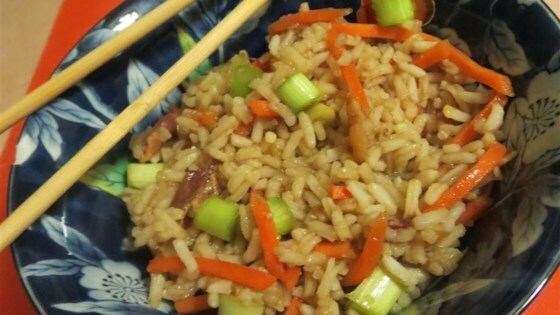 "A simple fried rice recipe chock-full of bacony goodness. It's very versatile - you can add chicken, eggs, or whatever you wish prior to adding the rice!" Place bacon in a wok or large skillet and cook over medium heat, stirring occasionally, until starting to brown, about 5 minutes. Pour in soy sauce and scrape up any brown bits from the bottom of the wok. Add green onions and salt; cook until wilted, 30 seconds to 1 minute. Add rice; cook, stirring frequently, until heated through, 3 to 4 minutes.